30 Jul 2018 Frankfurt - At the ISC'18 Exhibition,Primeur Magazinehad an enjoyable introductory conversation with Anastasia Alexandersdóttir from the Icelandic company Opin Kerfi. Opin Kerfi is one of the companies and in fact the leading company at the exhibition booth shared by a team of companies from Iceland that share the vision of Iceland being the ultimate location for HPC on the planet. With that, Anastasia Alexandersdóttir means that these companies recognize the ultimate conditions for HPC that Iceland has with its nature and with its business environment. These companies wanted to come to ISC'18 and promote their country for high-performance computing uses that the ISC'18 conference is showing. Primeur Magazine How long does the company exist? Anastasia Alexandersdóttir:Opin Kerfi started in 1985. Before that, Opin Kerfi was a Hewlett Packard Enterprise in Iceland. The company still has very tight bonds with Hewlett Packard Enterprise but also with other companies such as its team members Landsvirkjun, which is the national energy company of Iceland, and recently for example, with UberCloud. Opin Kerfi has a wide network of partners. Primeur Magazine Can you tell a little bit about the type of customers that you have? Anastasia Alexandersdóttir:In the international market, it has become very popular for heavy HPC users to come to Iceland, for example, automotive manufacturers, financial firms and research institutions, simply because they run very heavy simulations and very heavy environments. The reason why they were very attracted to Iceland is to save running costs. Total cost of ownership for them has been over 80 percent less than for example in Germany or in the United Kingdom. Heavy uses of high-performance computing is what Opin Kerfi is looking to get more of. Primeur Magazine How are you developing? Are you building new centres each time? Anastasia Alexandersdóttir:Yes, Iceland is really booming in this area. Iceland already has a huge capacity when it comes to data centres today but the country sees a big demand from international customers as well as domestic customers, simply because the conditions are optimal. Many people are discovering that companies are speaking to each other. When it comes to efficiency nowadays it is really something that people want to maximize. What they are discovering is that Iceland is the place to be. Opin Kerfi recognized this and is now building a 1.000 square meter data centre outside of downtown Reykjavik which is at the last stage. It is one of the optimal locations on the island as well where the company has three lines of electricity with two lines of black fiber. There is either double or triple redundancy in the providence of electricity needs. That is the vision that Opin Kerfi has and it already has a first customer for it which is the financial banking institution of Iceland, so it basically is the whole financial market that will be running from Opin Kerfi's data centre. Primeur Magazine If you look at high-performance computing, what is option that one is mostly choosing? Does one do co-location? Anastasia Alexandersdóttir:High-performance computing users have expressed two main areas or two main offerings of interest, namely high-performance computing cluster leasing, which is basically having a subscription from Opin Kerfi on both hardware and co-location of the hardware in Iceland. This has been popular because it is very simple. Customers just lease a specific type of hardware and capacity. Secondly, co-location has also been very popular and consists in shipping the infrastructure that the companies already have to Iceland to run it for 70 or 80 percent less than they do in for example Germany or the United Kingdom. Primeur Magazine This also explains why you are here at the HPC conference with a nice booth: you're not only here as a supporter for the Icelandic football team. 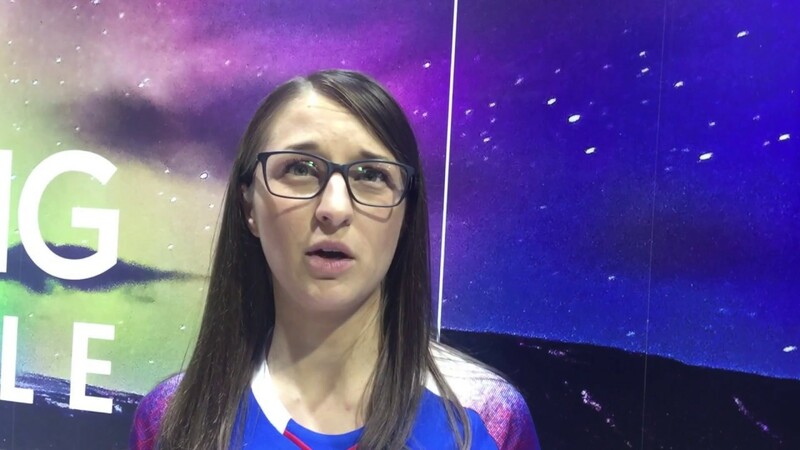 Anastasia Alexandersdóttir:No, not only, even though we are enjoying very much the publicity that Iceland is getting from the World Cup in football. Opin Kerfi is here to provide a sustainable and independent solution for heavy users. Whether you are an automotive company that is doing R&D; whether you are an institution; whether you are a university, you are looking to do it as efficiently and effectively as possible. The biggest cost of a data centre, especially of high-performance computing environments, is usually cooling and energy. In Iceland, cooling is completely free because it is always cold and energy is incredibly low cost because it is completely independent from the world markets and it is also one hundred percent green. This is a solution that Opin Kerfi wants to give to any heavy HPC user because it just simply makes sense. When you speak to the users and you ask them about the 10-year plan they don't actually have that most of the time. This usually presents a lot of limitations when it comes to asking for example what do they want to do and how much that is going to cost. In Iceland, you can run things at 82% of the cost so that is what Opin Kerfi is very happy to promote and the company knows that it works, so it wanted to go even bigger this year. Primeur Magazine Iceland is known for its cool climate. At least, in mainland Europe, we think that. But there are all kinds of other cooling solutions around today. If these catch on, will it still be useful to go to Iceland for that? Anastasia Alexandersdóttir:That is a very valid question. Many analysts and many companies asked me that. What Iceland has in this respect, when it comes to cooling, which is up to 40% of the cost of a data centre, is simplicity. We see so many presentations with complex cooling systems, immersion cooling for example, that is much on the rise. Opin Kerfi is not against it and does think that it is a tremendous technology and an incredible advancement in saving costs. However, when you run an analysis on how much infrastructure and how much extra equipment and safety you need to have around liquid cooling systems and immersion systems, you quickly realize that cooling systems from coming from fresh air cooling and ambient air cooling are actually the most cost-effective because they are free. All that needs to be done in a data centre in Iceland for example, is installing filters for the air. This cannot be applied everywhere in the world where the climate is good, even for free cooling, because of lack of purity in the air. Iceland has both purity of air and also the whole air cooling environment. So, all in all, this is great technology that we see coming up on the market, definitely amazing for sustainability and cost-effectiveness, but if you really want to go down in cost, you're going to look at free cooling definitely, which is why Iceland is still relevant. Primeur Magazine Thank you very much for this interview.